Welcome to the launch of the Consequences Audio Tour! If you’re in a hurry to listen to Chapter 1: THE PHOTOGRAPH, run to TOME TENDER BOOK BLOG RIGHT NOW! Me: Run run to TOME TENDER BOOK BLOG to find out! Tome Tender reads paranormal romance, historical romance, contemporary romance, urban fantasy, romantic suspense, young adult, steampunk, fantasy, and paranormal fiction. Tome Tender does not read non-fiction but is open to other fictional genre not listed above. Please note that Tome Tender will be honest and fair in all the reviews. This means that whether Tome Tender likes your book (or not) the review will be posted. Tome Tender’s reviews are also posted on Goodreads, and may also appear on, in part or in its entirety, Itunes, Smashwords, Tumblr, Facebook, TSU, Google+ and Barnes and Nobles. 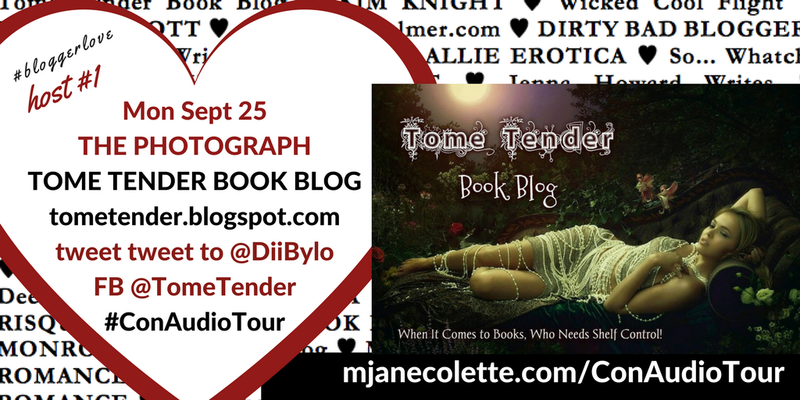 Tome Tender is open for author interviews, contests and/or giveaways and guest posts. Tome Tender also loves beautiful and artistic covers and is more than willing to do cover reveals and book blurbs for any book that will be reviewed. I’m so thrilled TOME TENDER accepted the invitation to be part of the Consequences Audio Tour, and that it will be the tour’s first stop. Thank you, Tome Tender Book Blog!